The Montreal Canadiens are having trouble scoring goals but the team has scored a hat trick when it comes to branded condominiums. 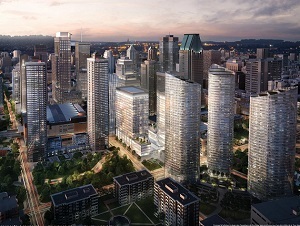 The close-to-$150 million Tour des Canadiens 3 condominium development has been launched near the Bell Centre in downtown Montreal. The tower is the third condo build in the proposed $2 billion Quad Windsor venture. Construction of the 55-storey, 567-unit condo tower is to begin sometime in 2018, depending on pre-sales, as part of a joint venture between developers Cadillac Fairview and Canderel and the Club de hockey Canadien. The building, located at de la Montagne St. and Saint-Antoine St., should be completed in 2021. “We expect that the sales will be very strong,” says Brian Salpeter, senior vice-president, development, Eastern Canada portfolio at Cadillac Fairview. Condos ranging from one to three bedrooms, as well as penthouses, will sell for between $200,000 and more than $1 million. There will also be 12 townhouses on the south side of the tower next to a two-acre municipal park planned by the City of Montreal. The first Tour des Canadiens with 552 units was the quickest-selling condo project in the history of Montreal, while the 590-unit Tour des Canadiens 2 sold out almost as quickly, says Daniel Peritz, senior vice-president of Canderel. Canderel’s roles in the three Tour des Canadiens include production, construction, sales and marketing and after-sales service. The first Tour des Canadiens has been completed and Tour des Canadiens 2 is on target for delivery in the second half of 2019. Overall, the Montreal market continues to be strong, with the city doing well economically, he says. Quad Windsor, which has been led by Cadillac Fairview, is part of a strategic move by the company to “create communities and not just sort of one project here and there,” Salpeter says. Cadillac Fairview started to assemble the land that comprises Quad Windsor in 2006. Aside from the three condo towers, it includes the 495,000-square-foot Tour Deloitte, the first downtown office tower to be built in 20 years. Also proposed are two office towers with a potential of 1.2 million square feet at 750 Peel St., just east of the Tours des Canadiens sites, and additional residential buildings at 600 Peel St.
Development of additional office towers will depend on finding anchor tenants, Salpeter says. He noted new office space at Quad Windsor could accommodate Amazon’s needs as part of Montreal’s bid to land the Seattle-based company’s second North American headquarters. Residential developments at Quad Windsor are part of “a trend of having sports and entertainment as an anchor for development.” He notes Quad Windsor is similar to the Cadillac Fairview-led Maple Leaf Square in Toronto and similar developments around the Staples Center in Los Angeles, Victory Park in Dallas and the ICE District in Edmonton. So far, buyers at Tour des Canadiens run the gamut of young and old, local and foreign, but the majority are Montrealers buying units for their own uses or for investment purposes, Salpeter says. He contends media reports many of the units in the first Tour des Canadiens have been used for Airbnb rentals – and often by rowdy partiers – have been overblown. The Tour des Canadiens 3 will include a boutique hotel-style, two-storey lobby, WiFi lounge with large- screen TVs and pool tables, an indoor-outdoor pool, a skylounge on the 55th floor and a storage area for online purchases and grocery deliveries. There will also be a pocket park outside the building, inspired by New York City’s Paley Park. A pedestrian bridge will cross above Saint-Antoine St. connecting the condo tower to Tour Deloitte, Windsor Station, the Bell Centre and Montreal’s underground network. As with the two other condo towers, the emblem of the Canadiens will be illuminated at the top of the building. Residents will be eligible for discounts for Montreal Canadiens games and other Bell Centre events. Peritz also revealed a proposed Canderel development on the site of the former Spectrum concert hall on Ste. Catherine St. in the Quartier des Spectacles area is being rethought by the developer. Once slated for an office tower, the project with a density of 1.1 million square feet will likely become a mixed-use development, with shovels hopefully in the ground in the next 12 to 24 months.